Your child is bright. Maybe a talented communicator. (All right, “chatty.”) Maybe athletic or artistic. Maybe all of the above. So why is learning so difficult? Why does reading not come naturally? And what now? Today I make the case for NOT leaving the responsibility of improving your child’s ability to learn entirely up to the schools. Humor me for a moment. Here’s why. As your child falls further and further behind, you watch any remaining confidence disappear. Shoulders drop. Resistance rises. Perfectionism may rear its ugly head. Take heart. You don’t have to sit on the sidelines and watch helplessly as the downward spiral continues. Children, and many adults for that matter, typically prefer to HIDE their struggles, not announce them to their peers. Translation: more stress, not less. Plus, by their very nature, accommodations work more like Band-Aids rather than address the underlying root cause of the struggle, especially if the aid in question is not a trained professional. Please know, you do not have to settle. Again, this approach does not address the root of the challenge. Worse, it asks children to repeat their failures again and again! Yes, of course practice makes progress. And yes, repetition may help those students who simply lack frequent exposure to words. For students whose unique ways of processing information are getting in the way of learning, however, this approach does more harm than good. Of course, you COULD let your inner worry wart take over. He’ll never go to college. He may never even get into trade school. She’s never going to move out of the house. EVER! He’s going to fall in with the wrong crowd, need rehab a few dozen times, then eventually find himself living in a cardboard box! (And the ever so popular…) I’ll be known as the WORST. PARENT. EVER! You can take action. You can start to believe that YOU have the power to change the trajectory of your child’s educational future for the better. Continue to learn all that you can about your child’s own personal experience with learning difficulties. Become an observer. Notice where your child’s eyes move when reading. Notice which words are skipped, added, or misread consistently. Notice your child’s resistance to certain schoolwork. Does she like to touch things, A LOT? Does he like to tell stories and use his incredible imagination, A LOT? Take note. You can use all of these observations to your advantage. If you’re worried that your child shows signs of the same challenges that you faced as a kid, take heart. Not only does that give you a treasure trove of information, it makes YOU the best person to understand your child’s perspective. You’re already a few steps ahead. Please understand, I never suggest that parents replace professional educational therapy. I also don’t recommend discounting valuable teacher feedback, or trying to go it alone. What I do recommend is that we avoid digging in our heels, going to war with the schools to force them to step up to the plate, all while we let our children fall further and further behind. Sure, advocate for your child whenever possible. Also know that you don’t have to wait before making a difference. 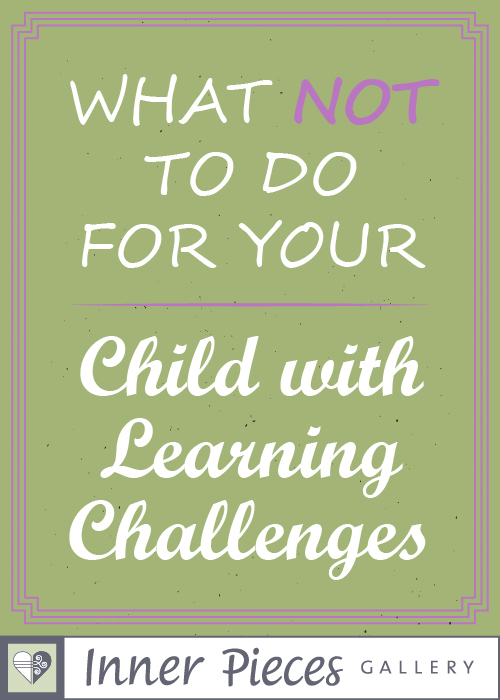 Start strengthening your child’s learning skills today! One simple way to do that is to explore the IPG blog some more. I recommend taking a look at the drop-down categories in the sidebar. The series Profile of a Unique Learner in the Unique Learners category is a good place to start. Then sign up for the Inner Pieces Gallery newsletter. You’ll receive blog updates, special offers on occasion, and private access to a growing list of free printable activities for kids. Some are just for fun. Most are also designed to strengthen your child’s ability to learn. Of course, when you learn how fun, effective and easy to use the free samples are, I welcome you to discover even more therapeutic activities in my store. Any questions, I’m always just an email away. And thank you, dear parent, for taking proactive steps that help remove your child’s limits to learning! Improve Children’s Auditory Memory with Which Word Goes Where?